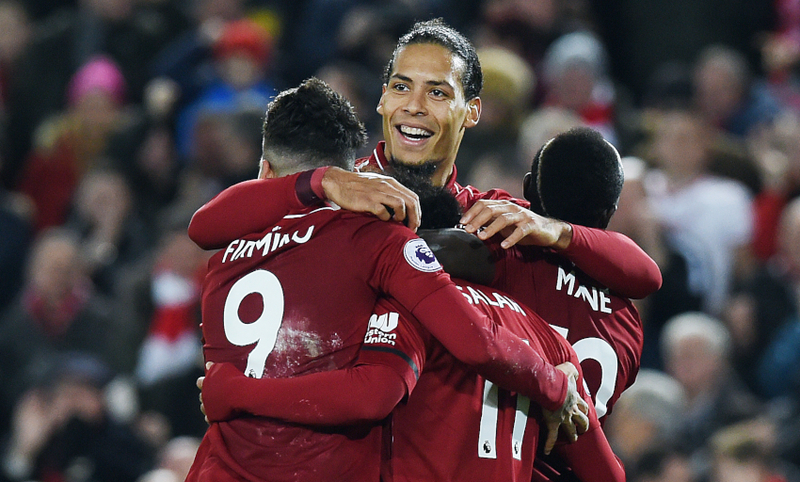 Jürgen Klopp revelled in an ‘exceptional result’ after Liverpool routed Arsenal 5-1 to move nine points clear at the top of the Premier League. Ainsley Maitland-Niles put the visitors ahead in the 11th minute at Anfield on Saturday, but the Reds’ response to that early setback was emphatic. 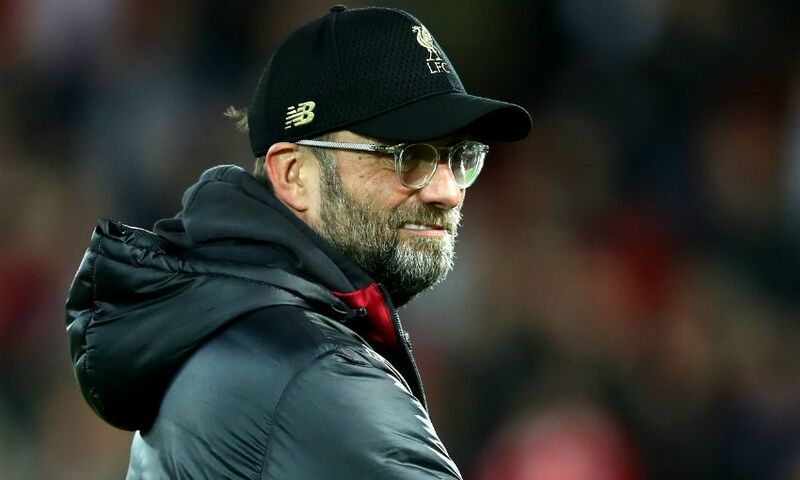 Two goals in the space of 90 seconds from Roberto Firmino saw Klopp’s team turn the game on its head almost immediately, before Sadio Mane made it 3-1 shortly after the half-hour mark. 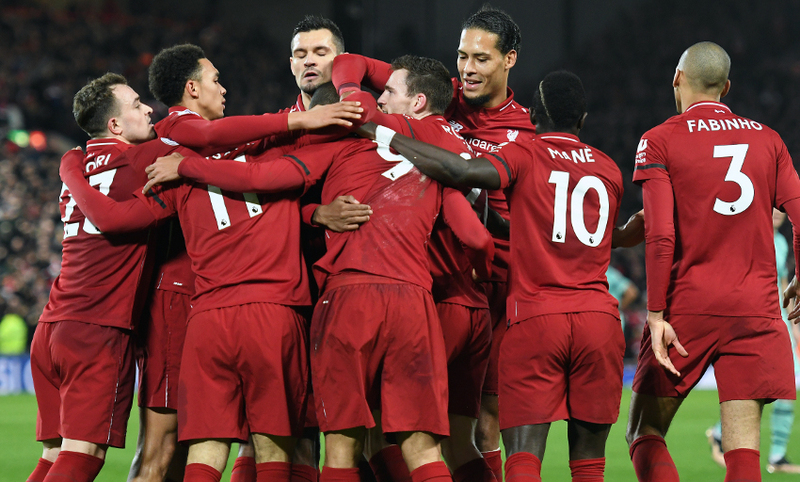 Mohamed Salah then won and converted a penalty to extend the Reds’ advantage on the stroke of half-time, and Firmino completed his hat-trick by slotting home another spot-kick midway through the second period. The reaction [to going behind] was obviously brilliant, absolutely brilliant. We didn’t concede a lot of goals obviously this year so you never know exactly how the reaction will be if you concede one, especially the first in the game, but the reaction was brilliant, just outstanding. We increased the intensity again a little bit, immediately put them under pressure again. Unfortunately I don’t know exactly how it was around the first goal, I saw the goal then but I forgot how it was, but I know the second goal was just brilliant defending. Sadio comes inside, puts the defender under pressure, wins the ball back then bam - Bobby goes more or less through the wall and scores that fantastic goal. The [fourth] one was a penalty, Mo in a one-on-one situation going in the box is always difficult for the defender and he finished that off with a fantastic penalty, and then the [other] one I just love because it’s again a goal after a second ball off a set-piece. We pass, pass, then Mo is there and can bring the ball in again and Sadio can finish it. So, good. Could we have played better in the first half? Yes, of course. Could we have defended better in the first half? Yes. We were a bit too open, a bit too wide in the formation. Arsenal is a really good football team and after 10 minutes we already forced them to play long balls but after 20 minutes they again played football, because we didn’t adapt in the right way. We wanted to change that in half-time and obviously did that, but we needed then a substitution [with] bringing Hendo to close the half-spaces because Ramsey was constantly in the half-spaces. [That] makes life a little bit uncomfortable with only two central midfielders, so we put in a third one and controlled that. We scored the fifth and 2018 ends with a Christmas present from Mo Salah. I love it, the gesture, I love it. He gives the ball to Bobby and he can score a hat-trick, so that’s just nice. In the moment I was not too happy because in training Bobby doesn’t finish penalties too often, to be honest, but obviously today it was his day [and that’s] absolutely OK. Again, we could have controlled the game even better with really big respect to Arsenal, they still had the high formation and they knew where they have to defend us because we didn’t move that good in between the lines so we had not a lot of options. Dejan Lovren, ball right, everybody shouts him [but] nobody is moving anymore. Also he tries to play the ball in behind and we follow that ball, run a lot, lose it there, run a lot - it was not necessary. It was not Dejan’s fault, nobody moved. He has the ball but nobody wants it. A lot of things we can do better but I really like that game because it was clear from the first second, from before the game, that it will be a big fight because Arsenal is a really good football team. It was wild, pressing, counter-pressing, pressing, counter-pressing from right to left and in the moment we can control it we have to control it immediately. We did it sometimes but not all the time, but winning 5-1 obviously is an exceptional result against Arsenal, so all good for tonight. What do you think? When we went to City last year, do you think I had the table in the dressing room and said, ‘We are fourth, they are first?’ It’s just not important, we wanted to win the game. We wanted to win the game - the league game, which we obviously didn’t do but we wanted to win it that day and I think everyone who remembers it saw that. The only thing that has changed is that you all ask [about] it, that’s all. It’s not a problem, you can ask what you want. We go to City not with whatever-point distance, we only go there to try to play the best football game we can play. 100 per cent. No, it was not for us [at Dortmund]. That’s the only thing I really remember, that it was not for us and we never thought about it. We were four points ahead for a while then we had Bayern at home. We won the game and Bayern missed a penalty, then we had six or seven points but the next game was the derby and stuff like that. It is a supporters and journalists’ game [talking about the points gap at the top] - and that’s absolutely OK, play it. But we cannot - we cannot be part of it, absolutely not. The only thing that can get annoying after a while is answering the same questions, so maybe you think a little bit about what you ask and not all the time the same! Then you will make my life easier! The other thing is, as long as we think about football then everything is fine. In the moment, it is a marathon that we are running, that we are part of. Before the marathon, the weather is brilliant, new trainers, new shirt, everything brilliant and the people say, ‘You will win today!’ But first you have to run. All the people around are really buzzing and one guy has to run. We are the guys and we have to run, so that’s what we try as good as possible. I don’t think I am famous for not being a positive person. From time to time, even I enjoy life. When we came in the season, the thing was if we can qualify for a third time for a Champions League spot then that would be brilliant. Now we have quite a distance between that, but do I feel that’s already done? No. Sorry, I cannot feel it! I’ve learned in sports like this that you think about the next step and not the next, next step. We don’t do that. The fans think we are in good shape and it would be crazy if they didn’t think we are not in a good moment, absolutely crazy. A few of them obviously have holiday at this time of year, so maybe New Year’s Eve will be a bit louder in Liverpool - hopefully not too loud because my dog doesn’t like it! But it might be bit louder. Enjoy it and do whatever you do, but be ready again on January 3. That’s all I am asking. Look, it worked and it’s one of the nicest things I ever saw in my life. Really, I don’t know a lot of players who would do that. When I saw him then celebrating with Bobby it was just wow, just outstanding. So far, the gesture of the season. Really, really nice.